Shel Perkins’ new book has been a popular read among independent designers, and if you’re a newbie freelancer, it’s worthy of your hard-earned cash. While some of the material might be redundant to street-hardened professionals, there are plenty of tips to satisfy the curious mind. 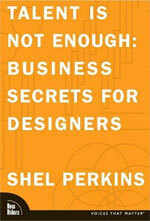 In an increasingly crowded book market, Shel Perkins’ volume on the business of design stands out for having one of the truest titles ever written. Indeed, talent is not enough. Surviving as an independent designer takes people skills, number crunching and a business-savvy swagger. Like design, good business sense is a natural talent. Some elements are sharpened by real-world tests: going out, cutting deals, interacting with prospects, being proactive about making money. Other pieces of the puzzle can be picked up by reading a book like Talent is Not Enough. Perkins understands that certain aspects of business can be not be taught, that a designer must walk certain paths alone, and that the best the world can do is offer helpful tips and signposts along the way. Consider this book your field guide. We all know that the business of design encompasses quite a few things. Client relations, finances, legal stuff, etc. Although Talent is Not Enough is divided into four sections — Career Options, Small Business, legal Issues, Large Firms — the book jumps around these topics like a kitten who snuffed too much catnip. For instance, the last two chapters in Career Options are “Income Taxes for Freelancers” and “Calculating a Freelance Rate.” The first chapter is a meager five pages of content, and beyond touching on the forms you should be bringing to the tax guy, fails to detail what exactly you can write off — meals, travel, your office. By contrast, the following chapter is long diatribe dedicated to arriving at that perfect market rate, and basically hits the nail on the head. Later chapters are equally disparate, with very tenuous themes tying them together. Chapter 7 is called “Becoming a Business” and covers the fundamental differences between sole proprietorships, LLCs and “C” corporations, but when the author recommends you check for name availability with your state government, he doesn’t say how. By contrast, chapter 9, “Setting Rates for a Firm,” is a long, detailed description of how to set rates for your small studio, complete with equations, examples and a nifty spreadsheet. The topical disparity of chapters can be unsettling. Chapters 4 and 18 are just sample agreements, while the last chapter — “Special Challenges for In-House Departments” — is so vanilla and generic in its content that there is almost no value to anyone actually working in or leading an in-house creative department. By contrast, chapter 10, “Marketing,” is a well-written, detailed primer on the building blocks of marketing and sales, an area many designers should study closely. Talent is Not Enough jumps all around the gamut of design business, targeting topics and writing about them with precision exclusivity. True to the book’s promise, there are many tips. But there are an equal number of holes. In a nutshell, it’s a mixed bag. There is no doubt Shel Perkins has written a useful book on business, but it’s best served as a side dish to more sustaining books on the topic. For the independent contractor — especially one that’s been solo for less than a year — it’s a great read. For more experienced business-focused designers, much of the material may be redundant. I read the book too. And it functions as a good primer. It is like a compendium, a syllabus. I haven’t read this book but it seems that it states something that every web designer/developer should know. A good designer may not be a good businessperson. I know this from experience as I used to be self-employed.